With the right policies and regulatory framework, trade can be a driver of green growth, decent work, environmental protection and resilience. What actions can policymakers take to create enabling conditions for sustainable trade and investment? Which trade agreements include environmental provisions? How can negotiators of regional trade and investment agreements ensure that these feature sound environmental provisions? 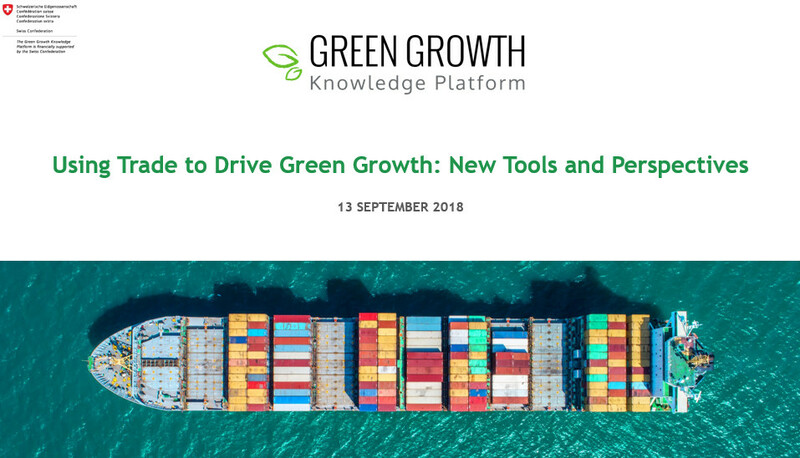 On 13 September (2:00 PM CEST), the GGKP held a webinar introducing a series of resources and tools designed to help policymakers drive forward sustainable trade. These include a new publication co-authored by UN Environment and the World Trade Organization (WTO) on "Making trade work for the environment, prosperity and resilience", a database of environmental provisions in trade agreements and a sustainability toolkit for trade negotiators. A lively panel discussion wwas followed by an interactive Q&A session with the audience. Policymakers submitted real-world policy questions before and during the webinar to feed into the discussion. This webinar preceded a joint WTO - UN Environment high-level dialogue on 2 October, taking place within the context of the 2018 WTO Public Forum, Trade 2030, and centring on the need for the trade and environment agendas to work in union to foster resilience and contribute to jobs, green growth and sustainable development. Speakers below from left to right.